The hot, lazy days of summer have arrived. As the quilt guilds have wound down for the season, and business has taken on a quieter tone, I am enjoying the company of family and friends and basking in the beauty of the great outdoors. 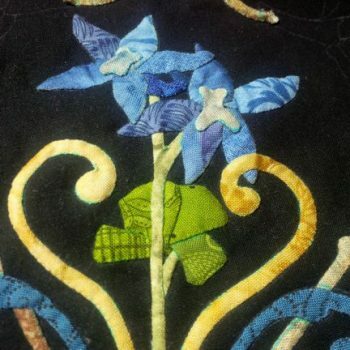 I find myself becoming refreshed and relaxed as I spend more time creatively, finally having the time to get to my beloved quilting. Although time is passing quickly – and we’re already into the second half of the year! 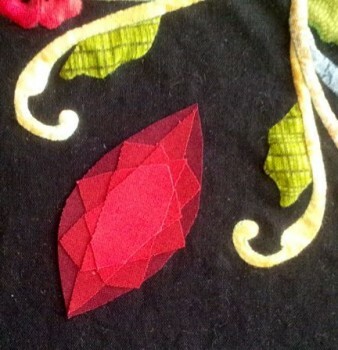 – my time quilt is also progressing nicely. The birth month flowers for July are the larkspur and the water lily. The larkspur, also known as the delphinium, is a tall plant with the center – the spur – resembling a lark. Its fragrant, open-petal blossoms are likely to have inspired its meaning of having an open heart with strong attachments. With more than 300 varieties, the three main colors and their meanings are pink for fickleness, white for a happy nature, and purple for strong bonds of love. 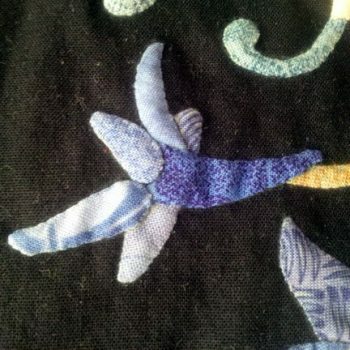 I chose blue-violet fabrics for the larkspurs in my quilt. The water lily – dubbed “the Queen of the Water” – and also known as the Lotus flower, is said to symbolize joy, purity, and majesty. It changes color from white to deep pink and actually bears fruit when in full bloom. 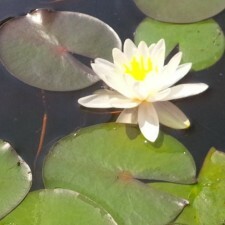 It has a single crown-like blossom on a large lily pad. 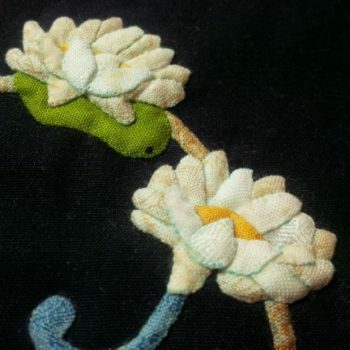 Each flower in the quilt only measures a little over an inch across, making the individual petals rather tiny indeed! Here is July in my quilt. The birthstone for July is the ruby. It is the most valuable of all the gems – known as the “king of gems”. A high quality ruby is a medium to dark red hue. 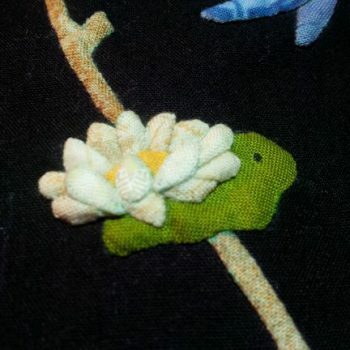 Here it is on my time quilt, at the 7 o’clock position for the seventh hour, the seventh month. With summer at the height of its beauty and majesty, it seems fitting for the month’s gemstone to be king and the birth flower to be queen. 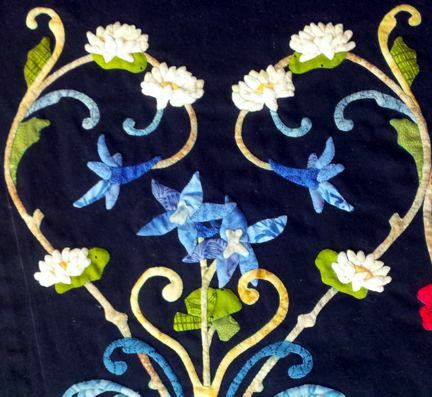 Many of you will enjoy summer vacations and time off work – perhaps also returning to your quilts, inspired by more time and nature’s floral artistry and bounty. May you be fruitful in your quilting as the days are longer and the time of harvest draws near.